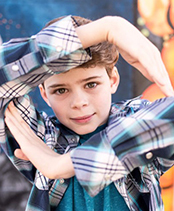 At 13 years old, Merrick is one of the most popular kid “poppers” across the internet. His incredible, robot-like dance talent and positive energy captures millions of viewers on social media, commercials and television. His appearances on America’s Got Talent, So You Think You Can Dance, The Ellen Show and on an upcoming major cable pilot continue to help his influence grow. Merrick's Audition from "The Next Generation: Auditions #1"